In the same way a little black dress will never go out of style, Scandinavian design will always be a classic home interior trend—it's even proven to improve your health too. There's something about its simple aesthetic that draws us in every time. While we definitely have a soft spot for a maximalist room, we'll always be a minimalist at heart. It's the no-makeup makeup trend of interior design, but just like the celebrities who tout that beauty look, these interiors did not wake up like this either—perfecting the sleek Scandinavian style isn't as simple as it looks. 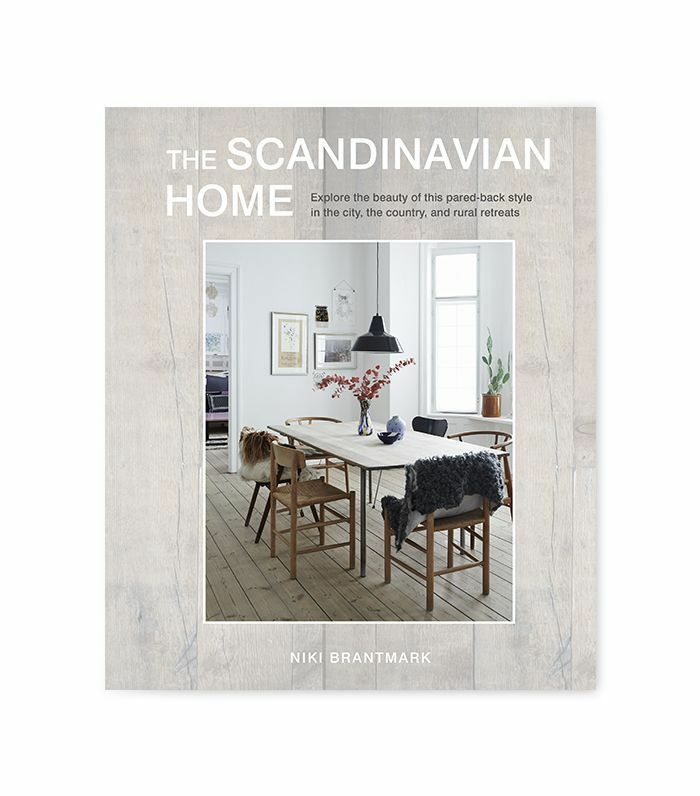 Mesmerized by this polished yet raw style, Niki Brantmark, founder of My Scandinavian Home, set off on a journey through Scandinavia to document Swedish, Danish, Norwegian, and Finnish homes for her new book, The Scandinavian Home. And while each of the countries has a distinct style, there are a few defining factors. "They are all pared-back," she told MyDomaine. "Generally, the walls are light (white or light gray are the most common choices) to draw in the natural light, and wood floors are dotted with rugs (you very rarely see a wall-to-wall carpet). You may see the odd accent wall in a dark color or patterned wallpaper, and plants and candles are an important factor too (even in the bathroom)." In this chat, Brantmark shares some of the lessons she learned so you can re-create the eclectic yet clean look at home too. Oh, and she reveals the new colorways that are taking over the all-white look. Get ready for the dark side. Scandinavian homes are perfect examples of the all-white space. Scandinavians know how to implement just the right mix of texture in a home so it doesn't stray into the cold and stark territory. Brantmark says this is all thanks to the use of natural materials in the furniture and wood flooring (something she says is abundant in Scandinavia's lush forests), adding an instant layer of warmth. "The room also feels soft and inviting, thanks to the layers of texture," she explained. "Think sheepskin throws, pure stonewashed linen, and wool blankets." Other natural materials include leather, wood, stone, wool, and cotton. "They can be added to a room in many different ways including furniture, tabletops, work surfaces, plant pots, blankets, and cushions," she said. "This is a great way of adding texture and interest to a space." Renowned for their clean lines and muted colors, Scandinavian spaces are aesthetically pleasing but also highly functional. Brantmark says Scandinavians achieve this balance because they "generally exercise a huge amount of restraint when decorating their homes." She explained: "Practicality is key, and furniture is selected both for its form and function. A sofa, for example, may be beautiful—upholstered in good-quality material and have lovely clean lines—but also contain inbuilt storage and double up as a bed. Choosing highly functional pieces means you need fewer items, resulting in a cleaner aesthetic." If paring back is something that doesn't come naturally, Brantmark urges us all to consider purchasing larger pieces (which are harder to replace) in neutral tones (such as light gray) and then add color and pattern using cushions, throws, and even creating an accent wall. "That way you can easily give your home a refresh without a huge amount of effort and investment," she said. The health benefits of decluttering are well known. There's something about that simple, cleaner design style that just makes us feel better just by looking at it. But ditching the stuff and abiding by a lean design aesthetic is much harder than it looks. However, Brantmark stresses that if you want to achieve the Scandinavian style at home, decluttering is key. "We're all guilty of buying things we don't need, and it can be difficult to part ways with our belongings, but it is quite therapeutic once you get started," she said. "I'd recommend starting by allotting five minutes a day and dividing items into three different boxes—keep, throw, donate. Once you've reached a level of items you're happy with, remember the 'one in, one out' rule: For everything you buy, one thing needs to go." To do this, you need to have great storage, both open and closed. "In our house, we have sleek storage that blends in with the house and adds to the clean feel," said Brantmark. "It's perfect for storing and hiding away things we don't use every day." From a distance (and on Pinterest), it seems as though most of the Scandinavian homes are all-white with dashes of natural materials, but do they ever use color? According to Brantmark, there has been a lot more in recent years, mostly deep, dark hues with an earthy tone. "I've spotted entire homes in dark gray or deep blue, but generally darker paint is used in one room, such as the bedroom, to create a cozy atmosphere," she said. "This year, we're seeing more dark green hues too. Wallpaper with bold botanical patterns is also becoming increasingly popular again; it's often kept to an accent wall or one or two rooms." If you're really serious about re-creating the Scandinavian style, then Brantmark says there are three main qualities you need to consider. "Natural light is essential (due to the long, dark winters), and as a result architects generally try to design homes with large windows," she explained. "This is also the reason people rarely use heavy double-lined curtains, choosing linen or other sheer materials that slip in pools of light. The floors are wood (sometimes painted white or light gray), and candles are essential for creating a warm atmosphere after dark." While this design style is brimming with high-end designer pieces (and lust-worthy vintage), Scandinavian interiors are renowned for their high/low infusion. The key, says Brantmark, is to invest in pieces that stand the test of time and can be passed from generation to generation, such as a beautifully crafted designer chair by Hans Wegner. "I'd choose to save on items such as cushions and throws, which can be easily exchanged according to the season or if you're simply looking for a quick update," she said. Don't be afraid to sprinkle in some IKEA or big-box store items with your favorite designer furniture. It brings an eclectic feel to the mix and adds dynamic visual interest. Scandinavian homes always look lived-in, not perfectly styled. In order to bring about this authentic appeal and steer away from that cookie-cutter look, Brantmark says it's important to mix and match. "Often you'll like more than one style, such as contemporary and bohemian or Art Deco, as well as pieces from different ages," she explained. "So it's important to go with this feeling and combine items you love regardless of which genre they fit into. Take your time to collect items you love and those that have meaning, rather than rushing into it just to get an instant result. This is what will give your home personality and a unique touch." One of the most important lessons Brantmark learned while writing this book was the process of creative expression. Artistic license is something the homeowners have unleashed in each of the abodes featured in her book. She discovered that with a little "vision and imagination" you can give something a whole new lease on life. "I saw wood from an old barn transformed into a state-of-the-art kitchen (using the leather from a reindeer harness as pulls! ), old warehouse windows recycled to create a light-filled bedroom, and even an entire run-down cottage without heating or electricity turned into a magnificent cabin overlooking the Norwegian fjords," she explained. But it isn't just old items. "One owner had bought a mirror for its shape but hated the modern clean feel, so she left it outside in the garden for two years where it lay under autumn leaves and a foot of snow," Brantmark told us. "It now takes pride of place on her mantelpiece and looks like an antique. Truly inspiring." Like what you see and want to learn more about this classic home design style? Shop Brantmark's new book below. What is your favorite interior design style? Will you always love the Scandinavian aesthetic?